Having completed our marathon trip of 3800nm to the far reaches of the NW Caribbean, we are now back in Trinidad, ready to haul Amoenitas for a refit and to return to the UK for Bruce and Tracey's wedding in early August. We had always planned to leave time to chill out at Tobago on our way back and were lucky enough to spend five weeks there, enjoying the relaxed atmosphere, quiet bays, superb beaches, splendid diving and wonderful trails through the steep, hilly rain forests. However, first to fill the gap between our last report from the USVIs and arrival here, a trip down the islands of some 650nm. That period in May was one of unusually strong trade winds which fortunately were mainly from the east. That made for robust and sometimes hairy sailing with typical 25kt, gusting 35kt winds and seas of around 8+ft. That meant we could make good if somewhat wet progress, stopping only at the islands we really wanted to visit. So the French island of Martinique was high on our list for provisioning and also some of the charming islands of the Grenadines. Below is the popular Tobago Cays, a group of four small islands protected from the ravages of the Atlantic by the Horseshoe Reef. Inside is a haven of calm, crystal clear water with superb reef snorkeling. The photograph is a panoramic composite of around eleven pictures covering an angle of about 180° which were digitally 'stitched' together on the computer (that's an excuse for the enhancement of the earth's curvature!). Hopefully, from now on you may start to notice the image quality improving as we are into serious digital photography country. From Carriacou we fought our way out into the Atlantic towards Tobago. It owes it's relative isolation and lack of development to the fact that it is well to east of Trinidad and the main island chain . The easterly trade winds and strong westerly current make it a more challenging sailing destination. Below is one of our favourite haunts, the appropriately named Englishman's Bay. Being remote, without any houses, we had the run of the gorgeous beach and superb reefs. Dave also got to do some deeper dives off the entrance where there were huge rock pillars, canyons and a steep drop off. It was here that Di had her first experience snorkeling with a shark, one she will remember for some time, even though it was a relatively harmless Nurse shark about 1.8m (6ft) long. Chilling out in remote bays can have it's supply problems but less so here. The mangoes were in season and the trees loaded. Our walks into the rain forested hills also uncovered sources of wild bananas, cashews, pawpaw, etc and there was always fish from the speargun. One aspect of our life afloat that we have alluded to but not dealt with in much detail is the underwater world. This is ever present and one of the most wonderful experiences of our voyage. The seas are usually crystal clear and the reefs offer amazing vistas of hundreds of varieties and colours of coral and sponges. Then there are the fish! Such a profusion of species, markings and colours that after two years we emerge almost every time to delve into our often inadequate marine reference books. Here are just a few of the underwater pictures we have taken to illustrate typical conditions and fish life. 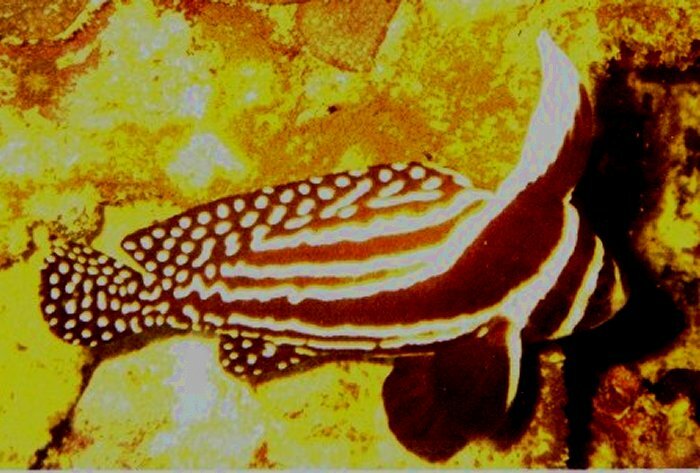 These Doctors or Surgeonsare about 250mm (10") long and are seen in ones or twos around the reefs. However, on this wreck they congregated in their hundreds, milling around the steel framework. The camera we have is called a Reefmaster which is a relatively simple, 35mm, automatic with underwater compensated flash, housed in a substantial yellow plastic casing that is good to depths of 50m (165ft). Dave likes to restrict himself to dive limits of around 25m (85ft) which gives him about 20 minutes bottom time without getting into decompression stops. 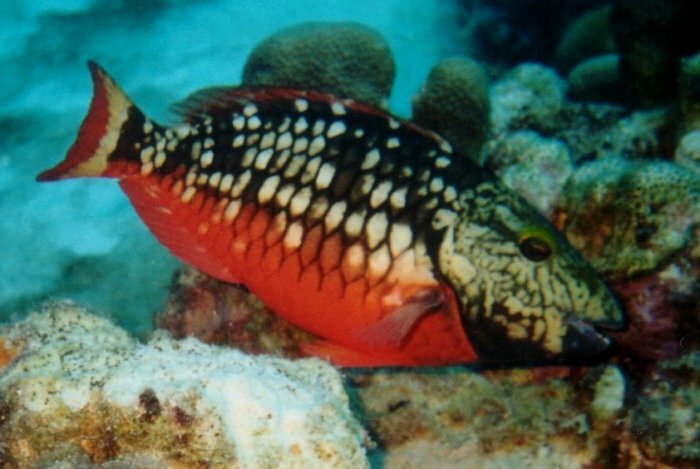 Above is an example of a Parrot fish, one very common denizen of the reefs. Ranging in size from 150-400mm (6-15"), they come in many colours, our favourites being the large light blue Supermales with a myriad of marking. They graze the coral feeding off the surface growth of plant organisms with such fervour that when nearby, one occasionally hears the substantial jaws removing the coral. This Spotted Drum from the tiny Newfound Bay on St John, USVI was quite large at around 500mm and the first we had come across. The bay is rarely visited by boats as the entrance is extremely narrow and guarded by shallow coral reefs on each side. Dave has seen two more since but much smaller, off Parlatuvier Bay in Tobago. 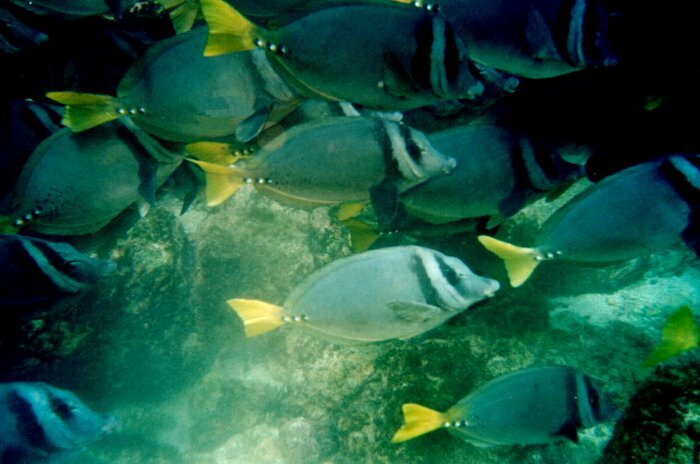 Snorkeling and diving, though achieving the same objectives, are totally different entities in our life-style. Snorkeling takes virtually zero preparation so is indulged in everywhere we go, almost every day, at a moments notice. Usually as soon as soon as the boat settles we don masks and snorkels, start by checking the anchor then move off to explore the reefs. 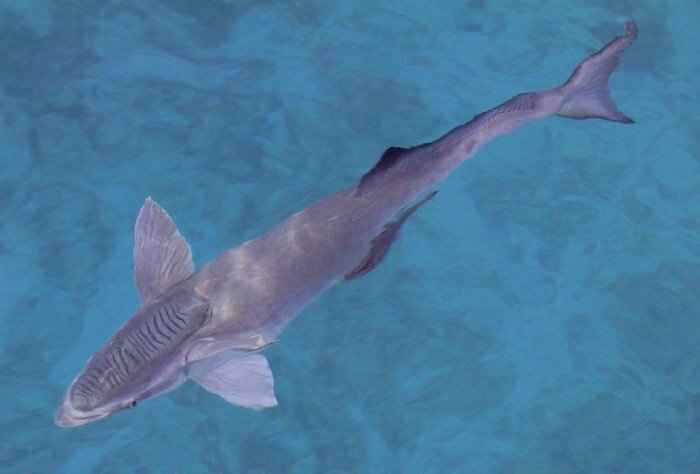 This large member of the Remora family was one of three that appeared off the back of the boat one morning at Norman Island, again in the USVIs. They are around 1.6m (5ft) long and bad news if the get close to you in the water. The pouch above the head contains hairy tentacles that grab hold of you. So far we have only come across them once whilst in the water. Now we'd like to return to our timen in Cuba, as there was so much to see and relate that we had to severely limit our first report on our nearly three months there. We felt we could have written a book! 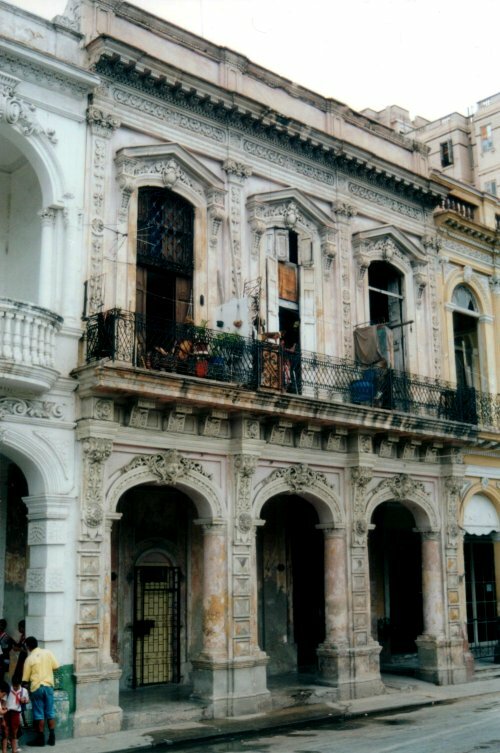 First a couple of town dwellings as architecture is one of the most striking aspects of Cuba. The Spanish style has been locked in a time warp of zero development and almost as much maintenance for at least four decades. The imposing Havana dwelling above is so typical of changes that followed Castro's revolution of the late 1950's. 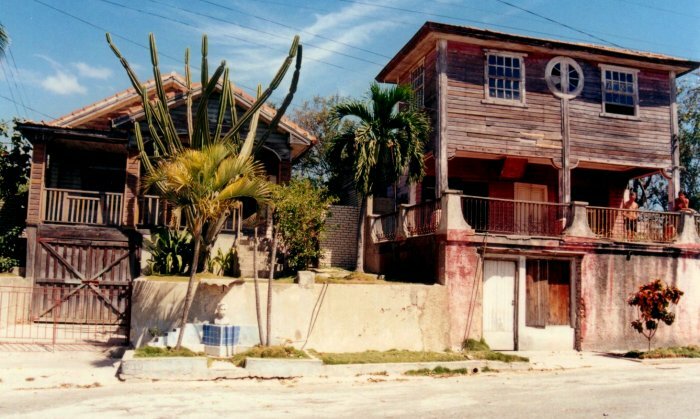 Once the home of a well heeled family, who are probably now exiled in Miami, now it offers a roof for perhaps six families, one to a room and maybe has several workshops on the ground floor. In the evenings the balconies are packed with people conversing across the street at several levels or just taking in the scene below. 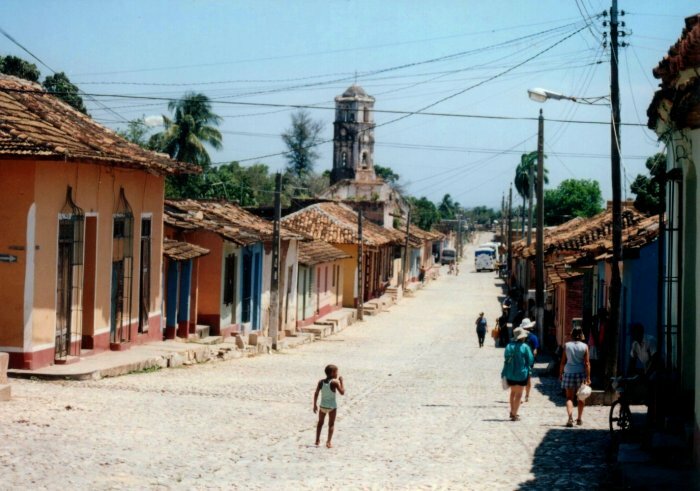 In contrast below are a couple of suburban homes near Santiago de Cuba in a late colonial style. There is a bust of Jose Marti their revered leader of the struggle against Spanish rule of Cuba by the roadside in front of the LH property. These are all palaces compared with the living conditions experienced by the vast majority of Cubans in the hinterland. They are more likely to have an earth floored, two roomed shack with a tin roof or if they are really unlucky, inhabit one of the crumbling blocks of concrete flats that the Communists of the USSR or GDR wished upon them. 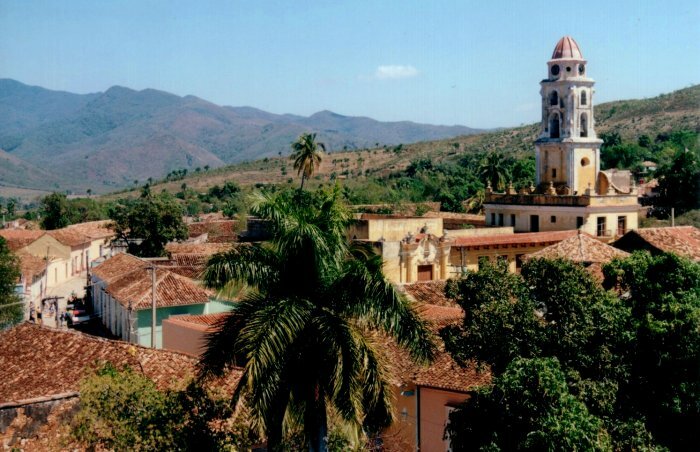 Yet another contrast is the ancient city of Trinidad in southern Cuba. It avoided virtually all change and development so is now a monument to the country as it was a hundred years ago, cobbled streets and all. It is a strange experience to join the many tourists exploring this living museum and observe the people looking back at them, almost saying "but what about us". The only change in two centuries to this street below is probably the plethora of service poles and wires. Not really much of an advertisement for change! As usual we leave you with a sunset. This one a dramatic seascape off the tiny port of Cabo Cruz on the southern shore of Cuba. To the left is the slanting mast of a Spanish wreck, not a galleon stashed with plunder but a Spanish flagged yacht that ran onto the reef about a couple of weeks before we were there. To the right, a typical Cuban fishing boat of crude ferrocrete construction returns to port. Before us is a new and exciting prospect. After two years in the Caribbean we are about to switch Oceans and begin a long trek across the Pacific. We hope to get away from Trinidad by mid-September and renew our acquaintance with the outer Venezuelan islands (Margareta, Tortuga, Los Roques and Aves). Then on to the ABC islands (Bonaire, Curacao and Aruba in the order we will visit). The plan is to do some serious diving in Bonaire and get to Cartagena in Columbia for Christmas, then move on to the charming, remote San Blas Islands off Panama early in the New Year. This puts in a good position to transit the Canal in February 2002. Once in the Pacific we have a 700nm sail to the Galapagos Islands which straddle the Equator. Then a 3000nm passage into the South Pacific Islands, heading initially for the Marquesas in French Polynesia. A mass of magical island names, then to Tonga where in about October we will make the difficult 1000nm passage to New Zealand.